All CGCMs have some systematic biases. NCEP-CFS is not an exception. The mean ISMR is characterized by rainfall maxima over central India (CI) along with north Bay of Bengal (BoB), Western Ghat and south of equatorial Indian Ocean region (Fig. 1(c)). Both versions of CFS (v1 & v2) are able to simulate rainfall maxima over Western Ghat and north BoB (Fig.1(a) and (b)) ; however, there are large dry bias over CI. CFSv2 is able to simulate the Equatorial rainfall maxima; however, it is shifted towards west in CFSv1. Therefore, rainfall bias has east-west dipole structure in CFSv1 (Fig.1(d)). Chaudhari et al. (2013) have shown that this dipole structure of bias in CFSv1 has large implications in other related atmospheric processes through feedback mechanism. A dry (wet) rainfall bias over east (west) Indian Ocean induces anomalous low level easterlies over tropical Indian Ocean and causes cold SST bias over east Indian Ocean by triggering evaporation and warm SST bias over west Indian Ocean through advection of warm waters. The persistent SST bias retains the zonal asymmetric heating and meridional temperature gradient resulting in a circum-global subtropical westerly jet core, which in turn magnifies the mid-latitude disturbances and decreases the Mascarene high. The decreased Mascarene high diminishes the strength of monsoon cross-equatorial flow and results in less upwelling as compared to that in the observation. It further increases the SST bias over the West Indian Ocean (Chaudhari et al., 2013). The ability to simulate the right location of equatorial rainfall maxima is a major improvement in CFSv2 as compared with CFSv1 (Saha et al., 2014). Nevertheless the fundamental problem of dry bias over Indian land mass (CI) still persists and it is further enhanced in CFSv2 (Fig. 1(e)). The monsoon is a coupled ocean–atmosphere system and its strength is determined by air-sea interaction processes. SST, being an integral part of the ocean, plays a significant role in influencing ISMR. Realistic simulation of SST SST is one of the necessary conditions for better simulation of ISMR. The seasonal SST is characterized by warm pool region (SST > 28° C) over east Arabian Sea, entire BoB, central and eastern equatorial Indian Ocean is evident from Reynolds data (Fig. 2(c)). 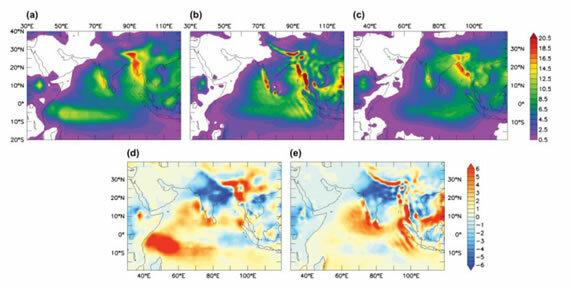 Both versions of the model are able to capture the spatial patterns of SST. However, the equatorial warm pool maxima is shifted towards west and there is a permanent east-west dipole structure in CFSv1 (Fig. 2(d)). On the other hand, CFSv2 underestimates SST over most of the Indian Ocean basin (Fig. 2(e)). Despite strong cold SST bias in CFSv2, rainfall pattern over BoB and equatorial Indian Ocean are reasonably good, which suggest, north-south SST gradient is more important rather than mean SST for the monsoon convective activity. 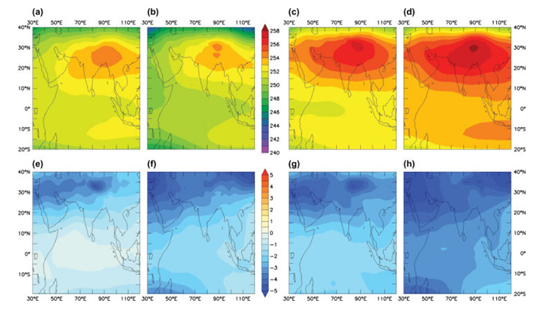 North-south gradient of the vertically averaged air temperature between 200 hPa and 600 hPa (known as TT) over Indian subcontinent region is very important in order to sustain the monsoon circulation (Webster et al., 1998; Goswami and Xavier, 2005) . The meridional TT gradient (TTG) is also closely linked with the onset and withdrawal of Indian summer monsoon (Ueda and Yasunari, 1998; Goswami and Xavier, 2005). The north-south TTG is calculated using vertically averaged (200-600 hPa) temperature difference between a northern box (40°E - 100°E, 5°N-35° N) and the southern box (40°E - 100°E, 15°S-5° N) ( Xavier et al., 2007). This TT is one of the most vital parameter which can be used to check the ability of a model for realistic representation of monsoon. Mean seasonal TT is dominated by elevated heat source of Tibetan plateau and a sharp meridional heating gradient, as large as 4-6°K, is seen in NCEP and ERA-Interim reanalysis (Fig. 3(c) and (d)). Both models are able to simulate the warm troposphere over Tibetan plateau along with the meridional temperature gradient (Fig. 3(a) and (b)). However, both models underestimate the mean TT as well as TTG (Fig. 3(e) and (h)). It may be noted that CFSv1 has more bias in TTG than that of CFSv2 (Figure not shown). Also, TT is underestimated throughout the Indian sub-continent region in both versions of the CFS model. Cold bias in the temperature field may be attributed to the ill representation of the ratio of convective and stratiform rainfall (Saha et al., 2014). Observation shows that the ratio of convective and total rainfall over the tropical region is about 40–50%. However, in both models convective rainfall has major contribution (more than 90%) particularly over oceans. Although CFSv2 shows some slight improvements in CRF over Indian land-mass, it deteriorates over equatorial Indian Ocean. Monsoon onset and withdrawal dates are also more realistic in CFSv2 than that in CFSv1. Other than improvements in mean seasonal fields, the intra-seasonal elements in terms of ISO variance and propagation characteristics are improved remarkably in the CFSv2 (Sabeerali et al., 2013). However, the speed of northward propagating ISOs are slower in both model and may be linked with the weak vertical shear in the zonal wind. Air–sea interaction expressed as a local SST and rainfall correlation is reasonably good in both versions of the model. Rainfall over Indian subcontinent is anti-correlated with Ni˜ no3 SST in a better way in CFSv2 as compared with CFSv1. A preliminary result from the sensitivity experiment using OSU/NOAH land-surface models indicates the role of land-surface processes on the simulation of rainfall maxima over equatorial Indian Ocean along with maritime continent region (Saha et al., 2014). It is found that, CFSv2 using NOAH (OSU) land model produces more (less) rainfall over maritime continent region. This causes change in low-level westerly wind due to changes in the tropospheric heating, which in turn affects the SST over equatorial Indian Ocean. Therefore, some of the rainfall bias may be linked with the proper representation of land-surface processes and those need to be identified and improved. Apart from this, convective and stratiform rainfall ratio should be improved through the improvements in the cloud parametrization schemes. This can reduce the cold bias in the model. Further improvement in the simulation of mean monsoon is expected to increase prediction skill of CFSv2. The above studies indicate that, there is lot of scope for improvement in seasonal prediction skill of monsoon rainfall in the CGCM, like NCEP-CFS.